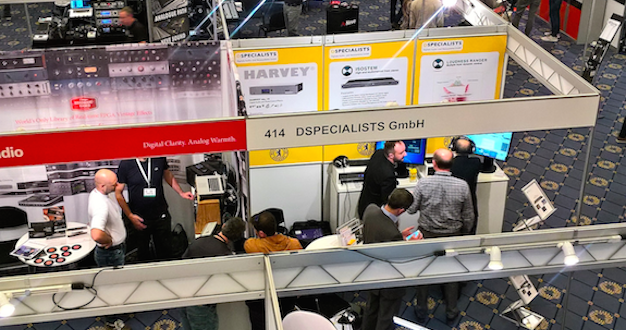 Returning to Berlin after a three-year absence, the 142nd AES Convention’s carefully crafted program of technical programs, seminars and workshops, plus a companion exhibition, ended here on Tuesday (23 May) at the Maritim Hotel. According to AES executive director Bob Moses, attendance at the event co-chaired by Sascha Spors from University of Rostock and Nadja Wallaszkovits from the Austrian Academy of Sciences was around 1,800, with All Access advance registration up 10% compared to last year in Paris. 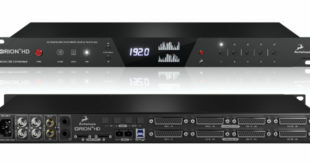 Antelope Audio unveiled the Orion Studio HD and also showed its new Goliath HD interface, which features 16 pre-amps and precision A-to-D converters, 64 channels of analogue and digital I/O with simultaneous streaming of 24/192 kHz data via Avid HDX-format for Pro Tools or USB 3.0 ports, together with MADI (to Dante Bridge), ADAT, S/PDIF and DB25 connections. A 64-bit Acoustically Focused Clocking technology with word clock I/O plus the Antelope Audio 10M Atomic Input is included. 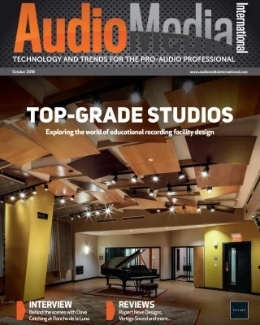 Avid demonstrated native support for the new 7.1.2 Dolby Atmos channel-bed format – the 9.1-channel bed using two dedicted height channels – for editing suites and Blu-ray remastering. Pro Tools now includes panning software for audio objects plus switching between automatable object and buss/channel outputs. Full integration for Atmos workflows is now offered for Avid S6 control surfaces and other devices. A new update to Nugen Audio’s Halo Upmix plug-in for Pro Tools – as well as the familiar stereo to 5.1, 7.1 or 9.1 conversions – now delivers 7.1.2-channel mixes for Atmos sessions. 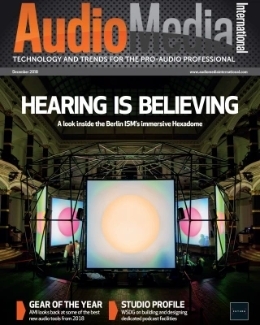 A prototype DAW plug-in for higher-order Ambisonics mixing was also seen. 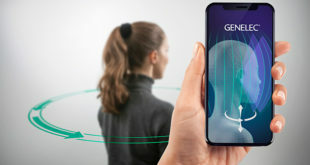 Genelec introduced its ‘The Ones’ near-field monitor range, which comprises the current three-way 8351 model together the new two-way 8331 and three-way 8341. A co-axial MF/HF driver is combined with two LF drivers for horizontal or vertical orientations. All three active speakers feature a new Minimum Diffraction Enclosure, and full compatibility with the firm’s loudspeaker management and alignment software. 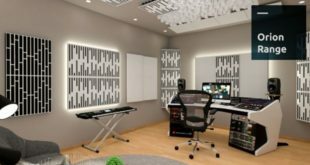 The new mc²96 Grand Audio Production Console from Lawo features an IP-based networkable topology targeted at large-format post production and live TV mixing. Available with up to 200 on-surface faders, new features include automatic gain control across multiple channels, and useful TFT colour displays above each fader that show LiveView thumbnails of the incoming sources. 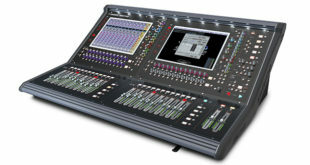 Stage Tec is now offering additional processing functions for its Crescendo Platinum TV production console, courtesy of V4.3 software, including an automixer with gain sharing that can be implemented on all inputs; a de-esser on every channel path; EBU R128 loudness metering for sum and group channels; together with scene automation that offers individual user-adjustable blend curves and times for each signal source. The dedicted Dante Pavilion was made up of several firms that offer networkable products, including RTS, whose intercoms incorporate cascadable Dante ports that also carry OCA system control; Focusrite, whose RedNet series of modular networked pre-amps and converters offer “enhanced reliability, security and selectivity” via Dante, according to Dankmar Klein, product specialist for EMEA/Germany; Heinz Electrodynamic Designs/HEDD, whose Series One monitor speakers feature both Dante and AES67/Ravenna ports for enhanced networking; KLANG:technologies, whose Fabrik Series of IEMs – currently out on tour with both Linkin Park and Justin Bieber – feature multi-channel Dante-capable I/Os; NTP Technology, whose DAD Series DX32R and RV32 Dante/MADI router bridges and control-room monitor controllers are fully compatible with Dante-compliant consoles and outboards; and Solid State Logic, whose Tempest processing engine is now fully Dante-ready with unique arbitration and ownership capabilities for both T Series control surfaces and Live consoles. During the opening ceremonies, current AES president Alex Case stated that “AES conventions represent an ideal interactive meeting place,” whereas “social media lacks the one-on-one contact that enhances our communications bandwidth with colleagues and co-workers." Keynote speaker Dr. Alex Arteaga, whose research integrates aesthetic and philosophical practices, addressed the thorny subject of ‘Auditory Architecture: Bringing Phenomenology, Aesthtic Practices and Engineering Together,’ arguing that when considering the differences between soundscapes, “our experience depends upon the listening environment.” His underlying message was that a full appreciation of the myriad way in which we hear sounds requires a deeper understanding of how listeners interact with that space. Moses announced that the next European convention will be in Milan during the spring of 2018. “The society also is planning a new format for the Fall Convention in New York,” he added, now aligning with the National Association of Broadcasters. 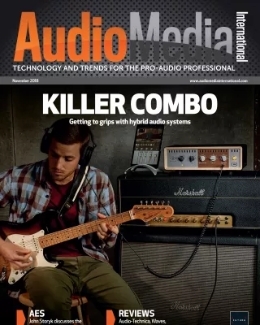 “And next January we will we holding a new type of event in Anaheim, California, to be titled AES @ NAMM.” Further details will be unveiled next month, he said. He also stressed there will be no West Coast AES Convention next year – instead the Society will return to New York in the autumn of 2018 with another joint AES/NAB gathering at the Jacob K. Javits Convention Center. ©Mel Lambert. All rights reserved.